One South Florida family found out the hard way that avoiding a bad contractor can require some digging. A makeshift awning is still in place nine months after Mariángeles Aguirre says she paid for a pergola to use as a carport. That’s because the contractor she hired took her money and ran. “He took two thousand dollars. I gave him a check and he cashed it and he never came back with a pergola,” she says. 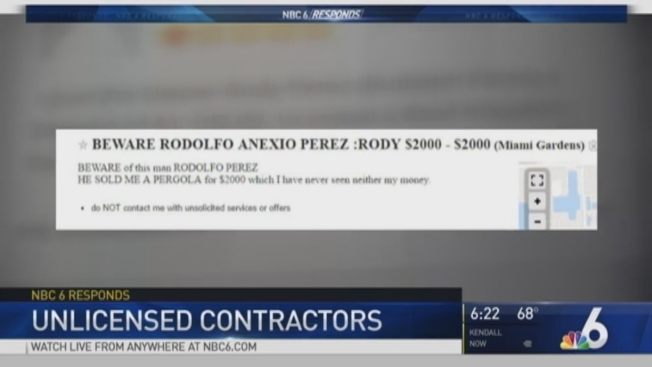 Aguirre of Hollywood says she found Rodolfo “Rudy” Perez, on Craigslist in May. She says he looked legitimate and had her sign a contract on letterhead. “He gave us a card with a fake license”, Aguirre says. She discovered he didn’t have a contractor’s license and that his company didn’t exist after he disappeared with her money. She sued him in small claims court but process servers couldn't locate him. Aguirre also took out an ad on Craigslist warning about Perez. That’s when she found out others lost money to him too. So she called NBC6 Responds to alert others. Our team wasn’t able to locate Perez either though we left messages. We also found out the State had also been looking for him after receiving four complaints with similar allegations to those Aguirre made. Aguirre now wishes she would’ve looked into Perez’ past before handing him a dime. To check on a contractor, log onto www.myfloridalicense.com and click, “verify a license.” There you can type in their name or company. If the contractor is licensed, you’ll see if he’s received complaints in the past. If he doesn’t have a license, you’ll know before it’s too late. Another good reason to hire a licensed contractor is the Florida Homeowner’s Construction Recovery Fund. It reimburses homeowners up to 50-thousand dollars if they lose money because of a licensed contractor.